No pictures to show today as I am almost finished a project I have been working on all week - a halloween costume for Smem (had to take a break from my quilt - bold!). 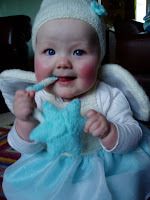 I've made a Two Summer Sundress, wings, a wand and a hat - she will be a pretty pretty fairy. Should get it finished tonight and hopefully she will be in good form for a photoshoot tomorrow. Knitting patterns will be on their cyber way to you today! The Christmas Tree Trims pattern is now for sale in my Etsy shop. Leave a comment on my blog this weekend and be in with the chance to win a copy. Three winners will be chosen at random on Monday morning and the pattern emailed to them. Good Luck! Don't think I mentioned it yet, but one of my quilt designs have been chosen for Irish Quilting. It will be in the third issue which will be out around March/April, i think. So on Friday, on my way down to Wexford, I called in to the shop that is to sponsor the fabrics for the quilt - Threads of Green in Kilkenny. Its a shop in an IDA park on the outskirts of Kilkenny and was a virtual Aladin's Cave for me. So hard not to spend all my money! 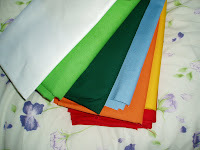 I can't give away the design but below are the fabrics I got. 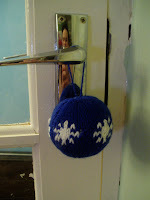 On the knitting front, I am working away on designs for Christmas. Hopefully I will have a leaflet for sale by the end of October with a few designs on it. No christmas tree up yet so the mug tree has been called into action! I have been away from blogland for a little bit. Went down to Wexford with Smem to visit the grandparents. And luckily the Wexford Opera Festival started last week also, so we got to go around a few of the exhibitions. In the short time that we were down there we managed to hit Johnstown Castle, Greenacres, Whites Hotel, The Arts Centre and Whitford Hotel, all of which had art exhibitions. The Whitford had the best as Breda was exhibiting. She does gorgeous textile pieces of irish landscapes and flowers and hedgerows. Beautiful and completely different to anything else you see. She had sold three before the exhibition had been officially opened - one of them to Mam! All my little hats! Had to take a photo of them today as they are to be sent off in the post. I can't remember how many I counted. Either 44 or 54. Not too shabby. I made loads initially but it tailed off quite a bit to the end. 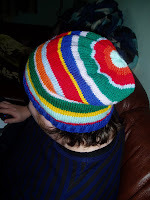 Finished the second Chaz Hat. This one was the right size. Just cast on 124 sts, 2X2 rib for 8 rows, then alternated the colours until it was long enough. Decreased by (K9, K2tog) to last 3 sts, k; then (K8, K2tog) to last 3 sts; and so on until, (K1, K2tog) to end, then (K2tog to end). Very simple but it turned out nice. And here is a picture of Smem in her blue dress. I think she likes it! Smem is in fantastic form again. Woo Hoo! And rather than having three little naps during the day she has moved to two longer naps of an hour or more, each. Oh the bliss! Gotta love getting her on to proper solids. She's had chicken and salmon this week. This morning got to finish the dress I started making for her over a week ago. I doctored a plain A-line top pattern that I bought on sale. It is now empire line, with elastic under the arms to facilitate easy put-on. It's not too bad. Messed up the inside a bit as I sewed it together in the wrong order. But I know for future. And its only a little bit messy in one part. After watching me knit tiny hats for the past two weeks, C asked for a hat for himself. So I made one. Last night peace was restored as Smem finally started to shake off her cold and had a great nights sleep. Praise the Lord! After 5 nights of broken sleep I was very nearly ready to call it quits. But all is well now. Might actually get some crafting done. 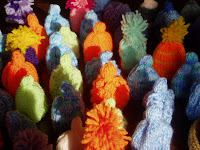 Up to 43 little hats now. Think I need to try something new! 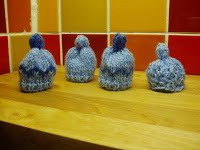 I've been making hats for the Big Knit all week. However, haven't got too many done the last two nights. Somebody has been refusing to sleep! Took some time out from hat knitting tonight to make a design of my own. 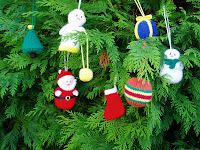 Thinking of making a few Christmas decorations to put together into a leaflet for sale in my Etsy shop. Just have to think of a few more to make. Not much crafting to report this week. Just lots and lots of hats. I'm up to 29 now so not going too bad. Great way to use up my flourescent orange. I bought that 25g ball with my pocket money when I was very young but have never had a good project to use it for. Now is its time to shine!